The Hamburg Port and Logistics company (HHLA) has announced their intentions to electrify the Altenwerder terminal container transport entirely. By 2022, the 100 container transporters in their fleet shall move on power from Li-ion batteries alone. In order to help increase Hamburg’s air quality, their eponymous shipping port has decided to take some serious steps. As of the next decade, container transporters powered by lithium-ion batteries will be responsible for moving the containers between the ships and the yard. The project is also receiving government support valued at about 8 million euros for the transition. 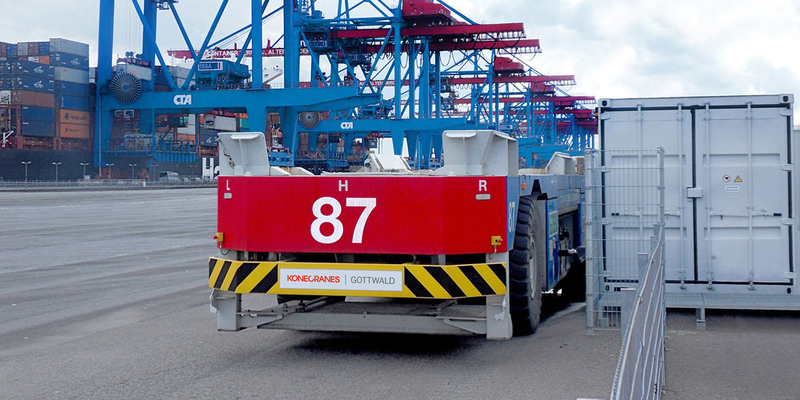 Hamburg Port and Logistics (HHLA) estimates that it will save around 15,500 tonnes of CO₂ and around 118 tonnes of nitrogen oxide each year by switching to electric transporters. By 2022 the entire fleet will have been electrified, and a 18 charging stations will be installed. There was also mention of using the vehicles as energy storage, which is another reason the government has been so supportive. “HHLA is implementing an exciting project in Altenwerder that will have three positive effects from the outset: It saves CO₂ and thus helps protect the environment, it reduces nitric oxide emissions, which in turn reduces air pollution, and, to top it all off, it serves as a flexible storage solution therefore further advancing the energy transition”, said Jens Kerstan, Hamburgs minister of environment and energy. 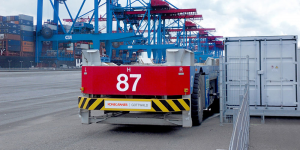 Already, a battery-powered automatic container transporter (automated guided vehicle, or AGV) prototype has been in operation at the CTA since autumn 2016 and was successfully tested including the dedicated charging station. Since then, six of these charging stations that use an automated arm have already been installed at the Altenwerder terminal at Hamburg’s port. were sold by Hyundai and Kia globally in Q1/2019 so that EV sales more than doubled in the first quarter.